Mr. Karácsony added that it would take him five years to recount every instance when a Fidesz politician came to him complaining about the state of affairs in the dictatorial governing party, with Fidesz loyalists secretly hoping for a loss to curb the regime’s boundless arrogance. “Today politics is synonymous with war and thievery. In this, Orbán is unbeatable,” said Mr. Karácsony, and then added how he would be different if elected: he would introduce “mild mannered and soft-spoken politics” in a country that has spent the last year wrapped up in Mr. Orbán’s perpetual verbal warfare. As an aside, I should mention that this was almost exactly the same approach that helped boot the first Orbán government from power in 2002. The Socialists, then under Péter Medgyessy, came to power by countering Fidesz’s verbal aggression and growing arrogance with a promise to implement a more conciliatory approach to politics and to focus on bread and butter issues. Gergely Karácsony in the Spinóza theatre. Photo: MTI. An issue that Ms. Rangos made sure to ask Mr. Karácsony about had to do with an apparent volte-face on the part of his Párbeszéd party. 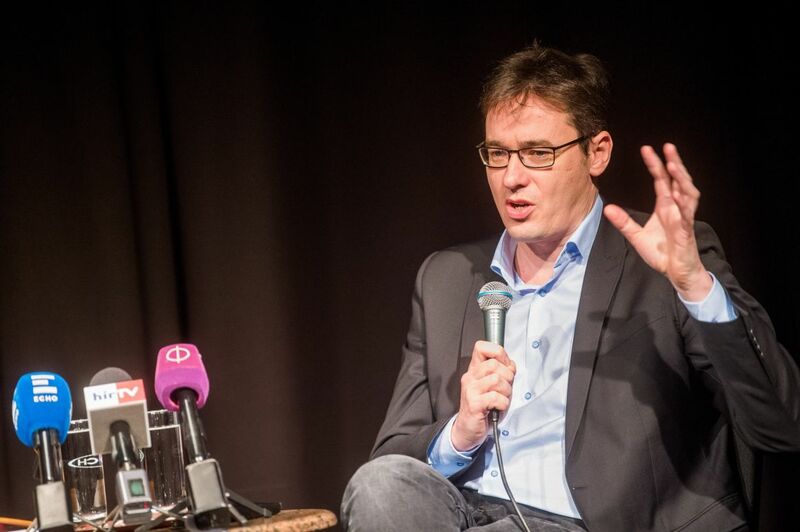 Párbeszéd and MSZP are not really natural political allies. Párbeszéd, even after it broke away from the Politics Can Be Different (LMP) party, remained a type of “new left” formation, significantly more progressive on socio-economic issues than the Socialists have been in the last 15 years or so. There is also a generational difference: MSZP, in its current form, appeals mostly to elderly voters, while Párbeszéd is primarily the party of well-educated thirty-something years olds in the capital. Mr. Karácsony, however, likened the somewhat unlikely MSZP-Párbeszéd alliance (which includes a joint party list) to the Olive Trea Coalition in Italy, which included a colourful and sometimes unruly group of parties, from liberals and Christian Democrats to green politicians and even communists. The unifying goal was to take down Silvio Berlusconi and the goal in Hungary today should be the same for the opposition, with regards to Mr. Orbán’s criminal regime. This big tent approach naturally raises the question about what to do with Gábor Vona and Jobbik. Should the left-liberal side enter into a marriage of convenience with the once far-right party? Mr. Karácsony believes that it should not. He feels that Mr. Vona is too much like Mr. Orbán, in that he is willing to change ideologies for political gain at any point. “If Gábor Vona continues to say what he is currently saying for the next 20 years, then I will believe him. But not until then,” emphasized Mr. Karácsony. Mr. Karácsony’s viewpoint is much more circumspect than that of so many leading voices on the left who, out of desperation, have been willing to embrace Jobbik in its current, more palatable form. But in fact Jobbik may actually have run out of time. Today we found out that the 331 million forint penalty imposed on the party by the State Audit Office (ÁSZ) stands and Mr. Vona’s party has 15 days to make its payment. Jobbik will also lose the bulk of its state funding ahead of the 2018 elections. It was also revealed today that Jobbik no longer has any money to pay its political advisers, which raises questions about whether the party can even contest the April elections. The Orban Regime will NOT collapse! The FIDESZ is invincible! 1. “without absolute majority the Orban regime will collapse immediately”. Many will probably start distancing themselves from the regime, but this will have little bearing on the events, initially. My bet is that in such case Orban will unleash total war (incl. violence and provocations if deemed advantageous) aimed at creating mayhem and whipping up fear, his old only-I-can-preserve-order panel, e.g. – riding on fake news “spontaneous” demonstrations will disrupt life, etc. etc. GK himself says that Orban is war/conflict and thievery. 2. In view of the above, to introduce “mild mannered and soft spoken politics” is a non sequitur to start with, and a highly unrealistic goal in the middle of a raging political (or civil) cold war- few think when the war drums are beating. It’s outright dangerous. The comparison with Megyessi is erroneous because we have a much more belligerent regime with “bloodthirsty” supporters now; and because of the fact that this “soft” policies failed miserably in the same period which saw Fidesz keep up the heat, the hatred and the war preparations enabling them deliver a smashing blow in 2010. I hope MSZP and the rest see things more realistically, sharp their weapons and keep the powder dry. Just what the opposition has to offer to the voters? In elections, like in any competitions, the better competitor will win. And the name of the game is not that who is more arrogant, hostile or can list more allegations against the opponent, but who offers a better solution to all the problems the nation faces? Orban do not offer the solutions, by my opinion, but the opposition has absolutely nothing to offer. Accusations, hate and animosity is not what the voters looking for. But qant solutions. Have not read a single word the left has ever offered any. – Much better investment and development policies (not difficult from the close to zero base of the Orban regime. – Much more equitable distribution of national revenue, unlike the current 75% going to the top 20%. – Civilised society, instead of the hate mongering, obscene coterie of Bayer, Schmidt, Pesti S, etc. – Rule of law, instead of the fascist or mafia state run by Orban and his cronies. Mr.Observer; thanks for stating something ! But my question really is; Have you observed any of that you listed when your party was in control of everything? Is that the platform of you party, or just came up with it for me? As for the use of the EU developement monies, all has been spent upon the the investigation, recommendations, supervision of Mr.Gyrucsany’s company, that now, according to his sworn statement his wife’s proprty. The firm has a 5 million Euro annul EB contract to manage just those.\ in all 28 EU nations. Yet, every time, here and on KMH, Orban was blamed for every one of those projects. Likely, Orban is guilty of not veto-ing every one of them in Hunmgary. By the way, did they pay taxes on the transfer of that corporation, whatever the total value it may had? You are an anti-Semite by not mentioning that Spinoza house is Jewish. You should go to jail. And I believe that your name is Lovas István, a far-right, pro-Fidesz publicist in Hungary who appears to enjoy trolling this site. Let’s apply the test of honesty. Challange this poster who used the name of “Gombost”. Ok Mr/Ms, Gombost, are you man/women enough to verify the above stated allegation? Are you as stated, your name being Lovas Istvan ? Be a “troll” or whatever, can you make your opinions stated inteligentlly, and hopefully in a more friendly and civilized manner than some other commenters? In that case, I for one would welcome that.